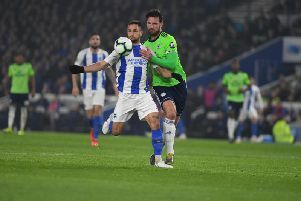 Albion are expecting their first sell-out home crowd for a Championship fixture since 2013 for the top-of-the-table lunchtime clash with Burnley at the Amex this Saturday. The club’s ticket office have now released all remaining home seats for sale, and fans wishing to attend this weekend’s game are strongly urged to move quickly to secure a seat, as there is now extremely limited availability, with less than 500 home tickets left for sale. Chief executive Paul Barber said: “The response from Albion fans has been superb. We saw an absolutely outstanding turnout at MK Dons, we are now very well set for a home sell-out this weekend, with more than 1,400 Burnley fans adding to what should be a great atmosphere. We’re hoping for good home ticket sales for our last three home matches against Fulham, QPR and Derby County too. Albion’s last sell-out for a league fixture at the Amex was the match against Wolverhampton Wanderers on the final day of the 2012/13 season, with the club already guaranteed a play-off place.